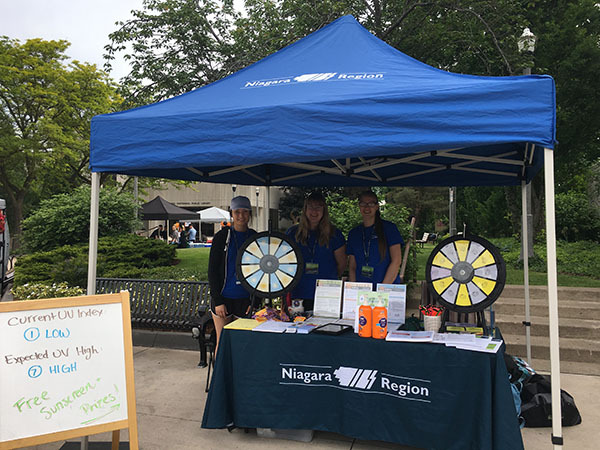 The Community Outreach Booth travels to events across Niagara from mid-May to the end of August. Trained students / volunteers raise awareness and share knowledge on a variety of health topics. This free service is for educational purposes only. Event organizers can select which topics they would like at their event. Learn about sun safety and skin cancer prevention through interactive activities and resources for all ages. Includes free sunscreen and give-aways. This booth provides posters, fact sheets, tips on how to talk to your teen about vaping, stickers, post cards and free giveaways. Includes information for parents/caregivers, teachers, children and youth on vaping and e-cigarettes. Sweetened milk, 100% juice, slush-type drinks, specialty coffees and more. Sugary drinks are everywhere, yet Canada's new Food Guide says to make water the drink of choice for everyone aged two years and up. Learn how sugar can affect health and how to sip less of the sweet stuff through this interactive display. Requests must be received at least four weeks in advance of the event. Complete a special events form to request the Community Outreach Booth at your event. Note: Bookings are not guaranteed and are dependent upon availability of the Community Outreach Booth student coordinators and volunteers.